They say that one man’s trash is another man’s treasure. Unfortunately, this statement is more reality than idiom for a large swath of the global poor that find their daily sustenance in city dumps. Perhaps the only shortcoming of this statement is that it leaves out the women and children that also scavenge city dumps around the world. Alas, city dumps are brutally equal opportunity. The city dump pictured above (June 2012) is in Guatemala City. The specs in the picture that look like people, are in fact people. They are referred to as scavengers in the local community. There are 13,000 of them that live in 16 slum communities surrounding the dump. Since the dump is located at the bottom of a canyon, it requires at least an hour walk down the canyon to get there. The people in this community are scavenging for recyclables that they can bundle and sell. On a typical day, they will work 14 hours and might earn $3 to $6 for the materials they collect. That’s before they pay a truck driver $2-$3 to drive their collections out of the dump. Mondays are typically good days because there’s more trash to sort through from the weekend. They risk themselves daily against the garbage trucks whose drivers have learned to ignore their presence. It is common for people to get run over or lose limbs. The dump has a preponderance of children – who are working. Many parents are forced to trade the long-term value of education for the near-term necessity of income. If you ask a child in this dump what they want to be when they grow up, they will say truck driver. For what better job can there be than the one who they pay $2-$3 to every day? This is the daily reality for some of the poor in Guatemala City. Sadly, poverty looks the same around the world. 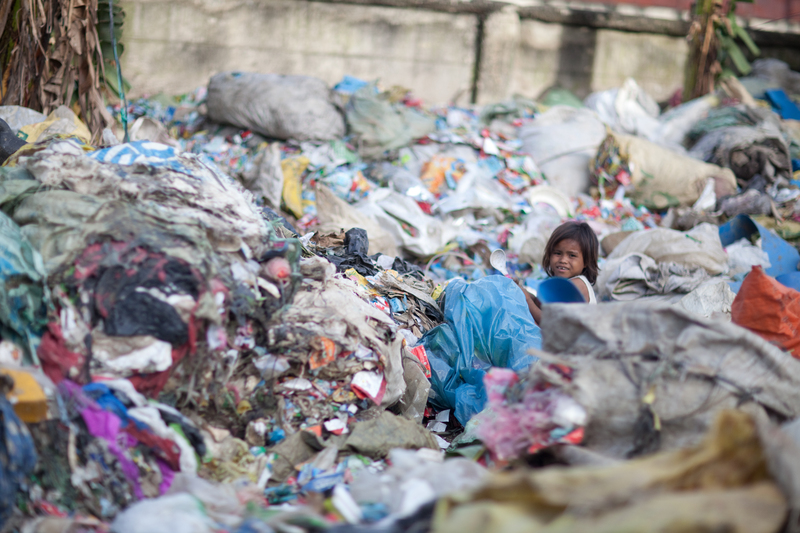 The city dump pictured below (April 2012) is in Cebu, Philippines. Children are born in this dump. Umbilical cords are cut with sticks. Shelters are built out of trash on the worthless land surrounding the dump. Proximity matters to have fast access to prized trash. Drug abuse and alcoholism are common to blunt the full and perverse effect of the daily routine. The cycle repeats, for generations. Thankfully, there are people who have dedicated their lives to care for the people in these dumpsite slum communities. In Guatemala City, it’s Potter’s House. In Cebu, it’s Grace Community Empowerment. In both cases, despite the dumpsite being a patently dangerous place, the staff members for these organizations are protected by the very people they serve. Walking around with them in the chaos of a dump, you would actually feel strangely safe. These organizations have had a profound impact on the lives of those they have served. They have helped parents create businesses. They have enabled children to go to school. They have treated wounds and delivered babies. They have listened and cared. But, probably most important of all, they have treated a community of scavengers, not like scavengers at all, but with the decency, love, and respect that all human beings deserve. For that alone may be the starting point for a brighter future. How Many Unique bit.ly Combinations Are There?